So I was reading this New York Times explainer on yet another failure to take the oil industry off the sweet, sweet gravy train. And my mind went back a bit to what’s missing from the current discussion—the long, long history of tax breaks this powerhouse industry has won for itself over decades. It’s a little scary, though, so brace yourself. The Senate on Tuesday blocked a Democratic proposal to strip the five leading oil companies of tax breaks that backers of the measure said were unfairly padding industry profits while consumers were struggling with high gas prices. Despite falling eight votes short of the 60 needed to move ahead with the bill, top Democrats said they would insist that eliminating the tax breaks to generate billions of dollars in revenue must be part of any future agreement to raise the federal debt limit. The defeat on Tuesday was expected since most Republicans were dug in against what they saw as a politically motivated plan in advance of the 2012 elections. Democrats had hoped that directing the savings toward the deficit would make it harder for Republicans to reject it. The statement above, by the New York Times reporter, is an example of the maddening sort of thing common in the so-called “mainstream” press as it struggles to appear “fair and balanced.” Even Republican politicians would admit in private that they are never opposed to anything principally because it is “politically motivated.” Almost everything they do is politically motivated—if not for attracting voters than for appealing to financial backers. Please name one politically suicidal act of conscience performed by the GOP lately—or in the last ten years. In the 52-to-48 vote, 3 Democrats joined 45 Republicans in opposing the bill, which was supported by the Obama administration and fiscal watchdog groups that saw the tax help for the oil industry as wasteful. Forty-eight Democrats, two independents and two Republicans backed it. It’s not that it is wasteful. It’s that it is welfare for the rich—giving an unnecessary advantage to those who already have every advantage. As I discovered in researching the background of the rise of the Bush family for my book Family of Secrets, so much of the unknown origins of political intrigue—from the strenuous lobbying effort to get the freshman Congressman George H.W. Bush appointed to the House Ways and Means Committee as a freshman, to John F. Kennedy’s political problems, to even Watergate—could be ascribed in part to the oil industry’s urgency for protecting tax breaks. Sometimes, the tax breaks have been the most important part of the industry’s profits. The most recent, defeated bill, sought to get rid of a number of loopholes and advantages. You can learn more here. The sordid history of just the oil depletion allowance alone reads like a Grisham thriller. Bad things happened to those who seriously threatened the allowance. President Kennedy demonstrated his willingness to buck big money during the “steel crisis” of April 1962, when he forced a price rollback by sending FBI agents into corporate offices. But Kennedy’s gutsiest—and arguably his most dangerous—domestic initiative was his administration’s crusade against the oil depletion allowance, the tax break that swelled uncounted oil fortunes. It gave oil companies a large and automatic deduction, regardless of their actual costs, as compensation for dwindling assets in the ground. FBI director Hoover expressed his own reservations, especially about the use of his agents to gather information in the matter. Hoover’s close relationship with the oil industry was part of the oil-intelligence link he shared with [CIA director Allen]Dulles and the CIA. Industry big shots weren’t just sources; they were clients and friends. And Hoover’s FBI was known for returning favors. One of Hoover’s good friends, the ultrarich Texas oilman Clint Murchison Sr., was among the most aggressive players in the depletion allowance dispute. Murchison had been exposed as far back as the early 1950s—in Luce’s Time magazine no less—as epitomizing the absurdity of this giveaway to the rich and powerful. Another strong defender of the allowance was Democratic senator Robert Kerr of Oklahoma, the multimillionaire owner of the Kerr-McGee oil company. So friendly was he with his Republican colleague Prescott Bush that when Prescott’s son, George HW Bush, was starting up his Zapata Offshore [oil] operation, Kerr offered some of his own executives to help. Several of them even left Kerr’s company to become Bush’s top executives. …Lyndon Johnson shared in the prevailing oil belt enmity toward Kennedy. In fact, he was the one person in the White House the oilmen trusted….After Johnson ascended to the presidency, he and newly elected congressman Bush were often allies on such issues as the oil depletion allowance and the war in Vietnam…. [oil executive Jack] Crichton (close with Bush and head of a secretive Dallas-based, oil-connected military intelligence unit that deeply immersed in aspects of the tragic events of November 22, 1963) was so plugged into the Dallas power structure that one of his company directors was Clint Murchison Sr., king of the oil depletion allowance, and another was D. Harold Byrd, owner of the Texas School Book Depository building.…. When [George HW] Bush arrived in Washington after the 1966 elections, he was immediately positioned to help large moneyed interests, and by so doing improve his own political fortunes. His father, still influential, had twisted arms to get him a coveted seat on the House Ways and Means Committee, which writes all tax legislation. The committee was the gatekeeper against attempts to eliminate the oil depletion allowance, and Bush’s assignment there was no small feat. No freshman of either party had gotten on since 1904. But former senator [and investment banker] Prescott Bush had personally called the committee chairman. Then he got GOP minority leader Gerald Ford—a Warren Commission member and later vice president and president—to make the request himself. It was a lot of voltage, but the rewards were worth the effort. George HW Bush now would be a go-to rep for the oil industry, which could provide Nixon with the Texas financial juice he would need to win the Republican nomination in 1968…. There would be growing anger in the Pentagon about Nixon and Kissinger’s secret attempts to secure agreements with China and the Soviet Union without consulting the military. 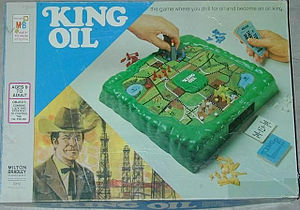 And there were the oilmen, who found Nixon wasn’t solid enough on their most basic concerns, such as the oil depletion allowance and oil import quotas….the oil barons were up in arms over threats to the oil depletion allowance, convinced that Nixon was not solidly enough in their corner. But they had other gripes. It turns out that in March 1974, as the effort to oust Nixon continued to mount, Congress and the Nixon administration were making things very uncomfortable for the Bush crowd. There were news reports that federal officials and members of Congress were looking into possible antitrust violations by people who sat simultaneously on multiple oil company boards. In a December 1973 letter responding to members of Congress, an assistant attorney general had confirmed that the Nixon Justice Department was looking at these so-called interlocking directorates. Who had been investigating these men? Nixon’s Justice Department. It was almost a perfect echo of what was going on in JFK’s final year in office—and in life. Jack Kennedy had been fighting with the same group of independent oilmen over the oil depletion allowance, and Bobby Kennedy’s Justice Department had sent grudging FBI agents into oil company offices to examine their books. Nixon and his old nemesis JFK had both angered the same people, and both had been removed from the presidency…. Robert G. Stone, who ran Harvard University’s board of overseers in the late 80s when it pumped massive investments into the obscure oil company Harken Energy at the time the firm was employing young George W. Bush and bolstering his political and financial fortunes, was a board member and sometime chairman of a whole range of companies involved with international shipping, the use of inland barges to move oil, and oil exploration. At one point he controlled one of the world’s largest cargo fleets. And he was intimately associated with a small circle of highly politicized oilmen whose names have appeared in previous chapters. He served as chairman of the board of the Houston-based Kirby Corporation, a shipping and oil concern substantially controlled by the family of the oil depletion allowance king, Clint Murchison. Energy-state Democrats criticized the initiative, saying it was misdirected and would do nothing to ease gasoline prices and could cost American jobs. Republicans, who on Wednesday will push their own plan to open more areas to oil drilling and speed government permits, said the Democratic proposal would contribute to higher prices and increase dependence on foreign oil even though a recent Congressional Research Service report predicted any impact on prices would be negligible. …on Tuesday, Senate Democrats wrote to the Federal Trade Commission seeking an inquiry into whether domestic oil refiners had reduced production to drive down the gasoline supply and drive up prices. “This is just another piece of the puzzle that we need to get at as we try to take away taxpayer subsidies to Big Oil and hold Big Oil accountable for whatever may be going on in the supply chain that is hurting the families that I work for,” said Senator Claire McCaskill, Democrat of Missouri. One wonders if Senator McCaskill really thinks she can hold Big Oil “accountable”—or whether she and her colleagues even understand the background to the current battle. Members of Congress are so overwhelmed dealing with the here-and-now, the frenetic pace of legislating, raising money and courting voters, that they’re often the last people in the room to have a good grounding in the history that shapes—and often dooms—their efforts.